The Ravens are ready to take the AFC North crown and bring another Super Bowl title to Baltimore. Led by a revamped defense, the Ravens look to put the league on notice. Baltimore will have to beat out rivals, the Pittsburgh Steelers and the Cincinnati Bengals, to retain division dominance. Grab your Baltimore Ravens tickets and help lead your favorite team on its quest for championship glory. It’s been a little over two decades since the Baltimore Ravens entered the NFL. It took them little time to make their mark and as a result of that, they have gone on to capture two conference titles, four division crowns and two Super Bowls so far. As for the last three seasons, the Ravens have not appeared in the playoffs. Will this be the year they finally bounce back? You will have to get your Baltimore Ravens season tickets to find out. The Baltimore Ravens fans have seen their favorite team accomplish impressive feats. Let’s take a look at some of those. Winning their first Super Bowl - On January 28, 2001, at the Raymond James Stadium , the Baltimore Ravens competed against the New York Giants at Super Bowl XXXV. Scoring three touchdowns within a 36-second span, the Ravens were able to defeat the Big Blue in a grueling contest to win their first Super Bowl 34-7. Linebacker Ray Lewis was declared the game’s Most Valuable Player. Ravens Vs 49ers –In 2012, the Baltimore Ravens not only won their fourth division and second conference championship but also met the San Francisco 49ers at Super Bowl XLVII on February 3, 2013, at the Mercedes Benz Superdome . After the dust settled, it was the Ravens who were left celebrating their second Super Bowl victory. They won 34-31. The Baltimore Ravens have rivalries with teams like, the Pittsburgh Steelers and the New England Patriots . Ravens-Steelers rivalry – This rivalry between these two sides ranked at the second spot on Sports Illustrated list of the Top 10 New NFL Rivalries. The Ravens and the Steelers played each other for the first time on September 8, 1996. Since then, they have gone on to face each other on multiple occasions. These two teams are the only ones in the AFC North to have won the Super Bowl. The Ravens and the Steelers last locked horns on December 25, 2016, where the latter emerged victorious 31-27. Ravens-Patriots rivalry - The rivalry between the Baltimore Ravens and the New England Patriots began when they faced each other on December 3, 2007, at the M&T Bank Stadium. The winners of that game were the Patriots who defeated the Ravens, 27-24. Since then, both sides have squared off in four playoff games all of which were held at the Gillette Stadium. Both teams have won two games each. The Baltimore Ravens were founded in 1996 and are owned by Steve Bisciotti. Their home ground is the M&T Bank Stadium. Located in Baltimore Maryland, adjacent to Camden Yards , M&T Bank Stadium provides Ravens fans with the perfect game-day experience. With stunning views of downtown Baltimore and a Skyline Club Level that features a historical perspective of football in Baltimore highlighting great games, teams and players from the area's rich football history, M&T stadium is a premier destination for all Ravens fans. Currently, John Harbaugh is the team’s coach whereas Ozzie Newsome is the general manager. The Ravens’ headquarter is located in Owings Mills, Maryland. They also have a mascot called, Poe. A number of star players have played for the Baltimore Ravens’ over the years and they have contributed a lot to the team’s success. Ray Lewis is one name that remained with the Ravens throughout his legendary career. During his time, he was not only picked thirteen times for Pro Bowl but also received the NFL Defensive Player of the Year Award twice in, 2000 and 2003. Moreover, Lewis also won the Super Bowl’s Most Valuable Player Award. Jonathan Ogden is another player who joined the Ravens in 1996 and stayed with the team till his retirement. He made eleven Pro Bowl appearances and was also named, NFL Alumni Offensive Lineman of the Year. Ogden was also included into the Baltimore Ravens’ Ring of Honor. Other than these stars, Rod Woodson, Shannon Sharpe and Deion Sanders also proved to be important players for the Ravens. All three of them have been inducted into the Baltimore Ravens’ Hall of Fame. Watching the Baltimore Ravens live in action is something football fans look forward to every season. Now is your chance to watch them in action. Grab your Baltimore Ravens season tickets and cheer for them from the stands. Our process for purchasing cheap Baltimore Ravens tickets is simple and fast. There are so many online ticketing sites, that it can be hard for customers to find the right place to buy Baltimore Ravens tickets at the cheapest price. At ScoreBig we think of our customers first and foremost. We offer daily deals for Baltimore Ravens events, so our customers can get the best seats for the best prices. ScoreBig will always go above and beyond to offer the cheapest Baltimore Ravens tickets on the market. The Baltimore Ravens schedule above, displays all available events for 2019 and 2020. Once you find the event that you would like to go to, click the red “Get Tickets” button. It is located on the right-hand side of the event listing, it will take you to an Baltimore Ravens event ticket page. ScoreBig's event ticket page will display all available Baltimore Ravens tickets for that event. On the event ticket page to help with your search for the right Baltimore Ravens tickets, use the filters at the top to select quantity, price range, and more. There is also an interactive seating chart so you can pick where you want to sit. When you are ready to buy a ticket, click on the listing, and you will be directed to ScoreBig's checkout page. Upon completion of the information fields, your order will be processed and your Baltimore Ravens tickets will be delivered via email, mail, or to your mobile device. What makes ScoreBig’s site stand out from the rest? We are constantly analyzing our competitors to improve our site, service, and prices. ScoreBig.com employees strive to offer the best process and experience to buy cheap Baltimore Ravens tickets. Our goal is to get you the best seats to Baltimore Ravens events. We offer daily discounts on our site and for special promotions check out our newsletter. If there are no Baltimore Ravens events currently available, you can use our search feature at the top of the page to see a list of all popular events going on near you. No matter your price point, we have all the best deals and discounts on Baltimore Ravens tickets. For more information on prices of Baltimore Ravens tickets and the schedule for Baltimore Ravens, check out our listings above. The last thing you want to find out is when the Baltimore Ravens event you wanted to go to is sold-out. Don’t worry in many cases ScoreBig has affordable tickets to sold out events. We sell tickets from GA all the way to premium seating and parking. Skip the scalpers in the parking lot and get your tickets online from top Baltimore Ravens ticket brokers. We get you in all events, buy your Baltimore Ravens tickets here from a brand that many trust and rely on for all their ticketing needs. ScoreBig offers a 100% money-back guarantee. If you have been in search of cheap tickets for Baltimore Ravens, ScoreBig by far is the best option. That’s why ScoreBig has more loyal customers than any other ticketing site. 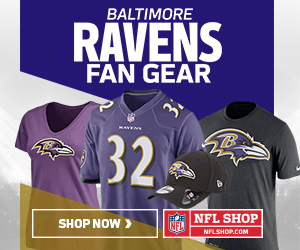 Shop at ScoreBig for safe and secure Baltimore Ravens event tickets.